I hope you're off to a great start in 2019! Are you ready to take action? The Action Guide is ready! I'll just include the Forward here. Click over to the website for full details including the Introduction, Table of Contents, and Menu. Recipes for Adventure started out as a food drying guide for backpackers who, like myself, wanted to eat healthy, homemade meals on the trail. Light-weight, well-preserved, and easy-to-cook, dehydrated meals turned out to be great for work and travel, too. As the weekday chef for our family, it’s my job to send wife and son off to work with nutritious lunches. Leftovers from the previous evenings’ meals usually suffice, but sometimes there are no leftovers. When that happens, I employ dehydrated meals and our thermos food jars. It’s a simple task to boil water in the morning. Come lunchtime, their meals are hot and ready-to-eat. Dehydrated thermos meals go with us on vacations, too. Before heading out for a day of exploration, we boil water using the kettle in the hotel room. Instead of looking for a restaurant that isn’t crowded during lunch, we stroll to the nearest park, and open our thermos. “The thermos method is my go to now for hot lunches at work.” –B.K. “Just did this when skiing earlier this week.” –L.G. “Great for school lunches.” –N.A. “I’m making these meals for my truck-driving husband.” –C.R. “It’s nice not to have to dig everything out for a quick, healthy lunch en route.” –B.N. “Makes fixing lunch quick and easy, so I have more hours in the canoe.” –S.B. “We use your recipes to dehydrate meals for our emergency survival kit.” –D.L. When you keep a supply of dehydrated meals on hand – for adventure, work, and travel – you’re automatically prepared for emergencies. Recently, friends in Florida and the Carolinas had to evacuate their homes due to hurricanes. In California, my sister evacuated because of a forest fire. Usually, we hunker down during storms. I’m reminded of the Great Blizzard of ‘93. My family got snowed in for a week, without electricity. Preparing for emergencies was the impetus for this Action Guide. 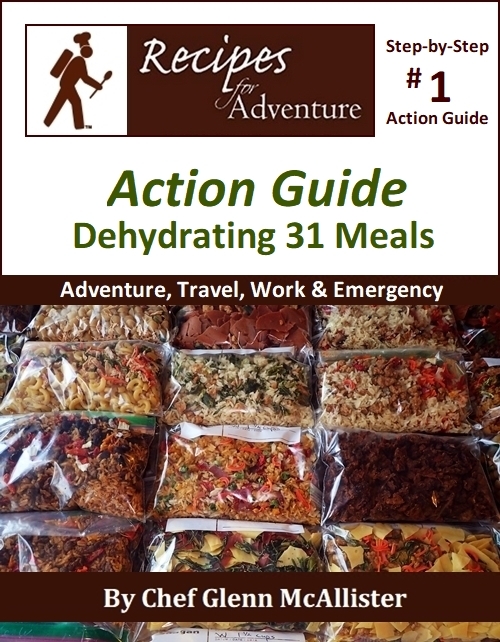 It’s a step-by-step plan to assemble thirty-one meals, using recipes and drying techniques from Recipes for Adventure. The Action Guide starts with a shopping list of ingredients, as well as a discussion of substitutions you might consider. Dehydration instructions are presented in logical order, followed by directions for meal assembly and storage. And the final step… bon appétit! Thank you for your trust. It is an honor to help you with your preparations. Click to buy 1001 Miles on the Appalachian Trail or Recipes for Adventure. If you received this newsletter from a friend and would like to subscribe (it's free), subscribe here. Visit my BackpackingChef Facebook page for the lastest posts. Be sure to "follow" the page to continue seeing posts.